Summer is one of my favorite times of year. There are few things better than being in my backyard watching my kids play and hanging out with my husband. 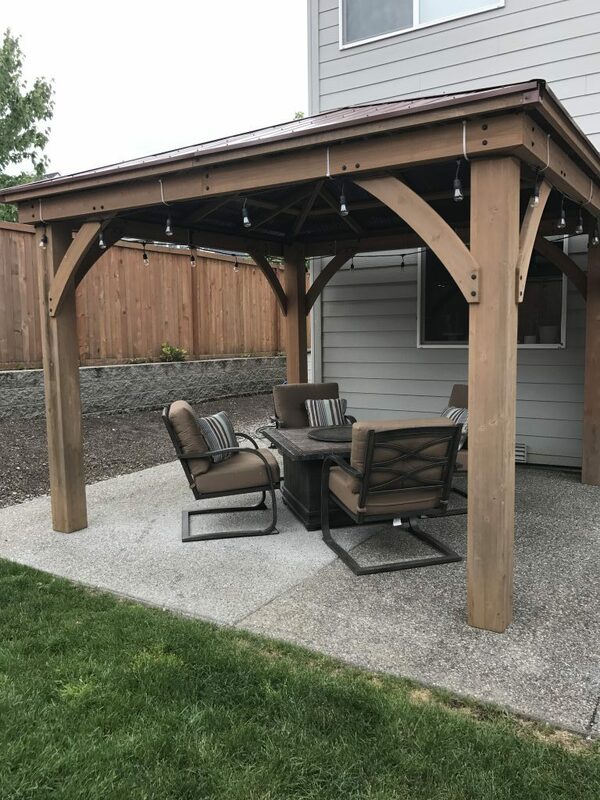 Last summer we purchased a gazebo and gas fire table from Costco for our backyard. It quickly became one of our favorite places in the house to hang out. Especially with a great glass of wine and some friends. The only problem was it was very hard looking. 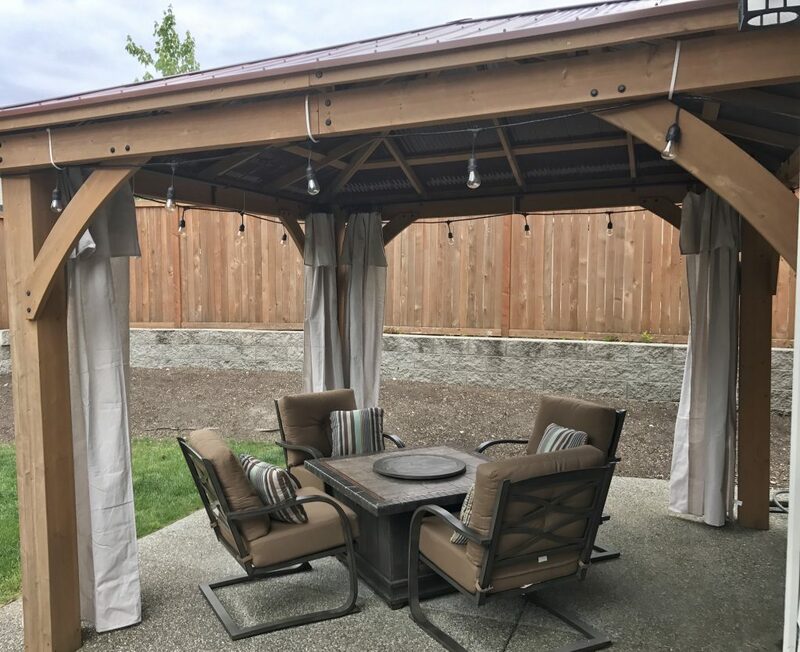 Our house is newer construction and we haven’t taken the time to do too much landscaping, so the gazebo its-self needed some softening up. I started shopping for some outdoor curtains to help out with this and was quickly turned off by the price of them. I was not going to spend $100 a panel for fabric that I was going to hang outside in the Pacific Northwest. So I decided it was time to get crafty. First I installed the curtain brackets to the gazebo. I put one in each corner and an extra one in the middle for extra support. Then I installed the curtain rods. I bought adjustable rods, so I just had to extend them to the appropriate length and place them in the brackets. Next I laid the drop cloths on my grass in the back yard. I measured the height of my gazebo. Then I took that height (minus an inch because I didn’t want them to drag on the ground) and measured it out on my drop cloth. I folded my drop cloth at that measurement and attached my curtain rings with their clips on the fold. Lastly, I walked my drop cloth over to the gazebo and slid the rings onto the curtain rod. Suddenly my drop cloths became curtains. This has by far been my favorite Housewife Hack of the summer. 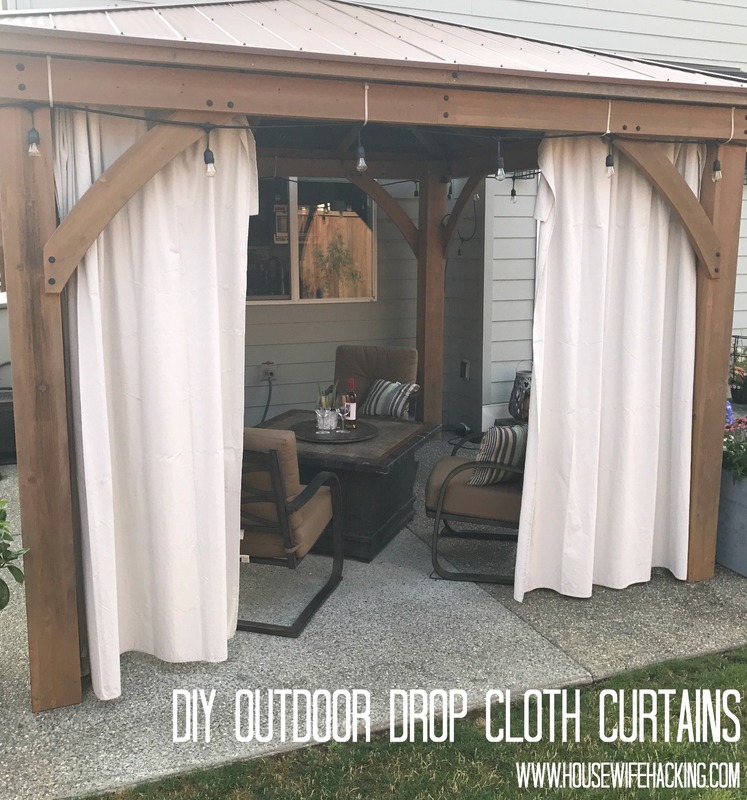 Not only do I love the look of my Drop Cloth Outdoor Curtains, but they are also incredibly functional. They have protected us from wind and rain (because yes, we have that year round here), given additional shade when it is needed and kept the setting sun out of our eyes. The curtains also do a great job of keeping in the heat of our fire pit on cooler nights. If all of this is not good enough, at the end of the season I can easily take them down, wash them and store them for next summer. Even if something were to happen to one of them, I can easily purchase another one without the guilt of dropping another $100. Hope you are all having a great summer! Happy Hacking!